There's a science to reorder management and we're VERY excited to announce the addition of Smart Reorder to our industry-leading suite of multichannel services. Smart Reorder takes the guesswork out of inventory forecasting and is designed with FBA sellers in mind. Smart Reorder answers two pressing questions for you: "When should you order more inventory?" and "How much should you order?" We use your sales data, profitability (including commission and cost), and a reordering model to calculate the optimal quantity and reorder point to maximize your profits! 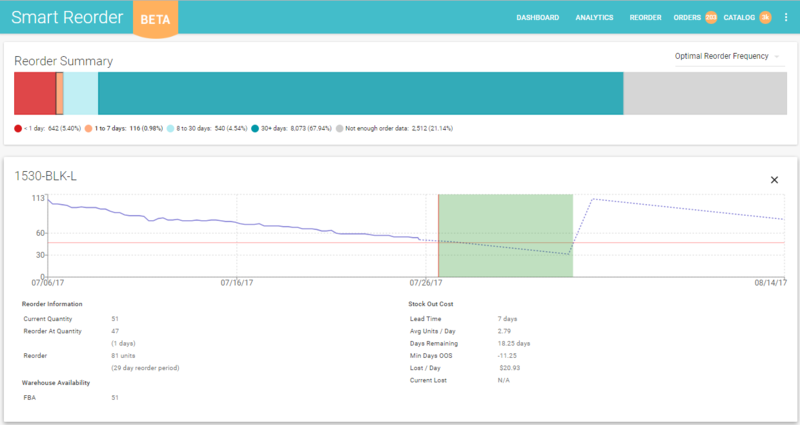 Using historical sales data for your SKUs, taking into account lead time and holding cost, Zentail's Reorder Report calculates all of the most important metrics for your catalog. The first thing you'll notice is the Reorder Summary which contains a color-coded visual representation of your catalog through a segemented bar chart. In most situations, you'll want to minimize the number of SKUs that have less than 1 day in stock. SKUs are categorized as having "Not enough order data" if they've never had any sales. This section gives you a your SKUs within a certain segment, and displays some of the most important metrics for reordering. This can also be downloaded to a csv. Clicking on a SKU within this Product table opens up a detailed chart with further information for a given SKU as shown above. SKU - Clicking the SKU on this table opens a new tab for your Catalog page. You can then edit any necessary information, like cost for this SKU. Lead Time - Lead time is the numner of days from when you place an order until it actually arrives at your warehouse. Currently, we assume this to be 7 days for all SKUs. Reorder Frequency - More information coming soon, including an explanation of a negative Reorder Frequency. Units / Day - This is the sales velocity of your SKU, or how many units per day we expect you to sell based on your most recent sales for that SKU. We only calculate sales while that SKU is in stock (meaning if it goes out of stock, we won't recalculate its sales velocity until it comes back in stock). In Stock - This is the total inventory available for this SKU. It includes inventory across all warehouses. Reorder Level - This is the point at which you should place another order for this SKU. If you have a Reorder Level of 15 units with 16 units in stock, then you should wait until 1 more unit sells before reordering that SKU. If your Reorder Level is below the number of units in stock, you should reordered that SKU already! Order Quantity - This is the amount you should order for a given SKU once your inventory reaches, or falls below, the reorder level. Days to Reorder - This estimates how many days will go by before you need to place an order for that SKU. It is calculated based on your sales velocity and the amount in stock. For example, if have 100 units in stock, your sales velocity (units / day) is 10 units per day, and your reorder level is 50, we estimate it will be 5 days until you have to reorder this SKU. Days to Stock Out - This calculates how many days of inventory you have for that SKU given the current sales velocity and in stock inventory. Item Price - This is simply the item price for which a shopper can purchase SKU. It helps us calculate your opportunity cost. Opportunity Cost - This displays how much profit will be lost given the inventory conditions of your SKU and your calculated profitability. If your SKU is going to be out of stock for a given number of days (Days to Stock out - Lead Time), you will have an opportunity cost based on the number of sales you would lose out on while this SKU is out of stock. We use the average profit for this SKU, which takes into account the cost, marketplace commission, and shipping cost associated with the SKU. Smart Reorder will soon allow you to create optimized inbound shipments to FBA, and our growing ecosystem of 3PLs including FedEx Fulfillment, Rakuten Super Logistics and ShipBob.